Tanya X. Short is the Creative Director of Kitfox Games,whose Kickstarter for Moon Hunters recently ended. Their first game, Shattered Planet, released to Steam in July 2014. Update: Ian Kragh pulled official stats on the campaign, available for you to view here! Furthermore, due to Survivorship Bias, it is generally more useful to learn from failures than from successes. So I recommend everyone to do some hunting and find those devs brave enough to talk about their unfunded campaigns... and give more weight to their learnings than you do to mine. It’s important to note that we did not follow a formula, and there is no formula to be followed -- no matter how much preparation or planning, no matter how cool a game concept is, there is always always an element of luck in any success. We were lucky, Survivorship Bias, etc. Lowest possible funding goal: Our goal covered even less than the game we wanted to make -- we literally cut everything possible to cut and turned those into stretch goals, such as a fourth biome/environment and digital art book. It was primarily to not overcommit (a good producer always knows what's cuttable), but had the side-effect of making it possible to reach our funding goal that much more quickly. Add-ons are confusing: We didn’t want to give away extra T-shirts and posters and other physical rewards to people who didn’t actually want them -- that would be the height of unnecessary waste, of money and labor both. But many people don’t know what an add-on is, and it’s a weird process to manually adjust your pledge a certain amount to indicate you want an add-on. We anticipate spending a few weeks just sorting through add-ons, and we’ll probably make a few mistakes when we compile all of our mailing lists as a result, but unless Kickstarter implements some kind of ‘shopping cart’ system (which is probably illegal or something), I’m not sure there are any better options. Why did we appeal to randos browsing Kickstarter? We’re super-grateful to Kickstarter and all of its channels as a commerce platform, because a full 37%, $66,000, of our money came from their channels. That’s a lot! Probably-maybe more than most! Something we did “clicked” with gamers on Kickstarter specifically -- if I had any idea what it was exactly, I’d tell you. Did running during PAX help? If so, how much? We launched the day before I left to speak at PAX Dev and manage our booth at PAX Prime, and we were funded while we were there. I definitely met and hugged a few backers, and people who proclaimed proudly to me that they would back when they got home, and also met with a bunch of small press. I have a strong feeling that it’s part of why our funding-slope on the chart does’t flatline in days 4 and 5... but… I have no idea how to quantify how our profile was raised during that time, and how much of it turned into Kickstarter dollars. What was the effect of very few high-end rewards that max out at $1500? Both of our top rewards were taken in the first week. Which was sticky -- we couldn’t introduce new higher rewards for fear of devaluing our two top supporters, and we didn’t have much else to offer anyway. Maybe we would have gotten more if we’d made more room for super-funders? Did shout-outs to other Kickstarters help? After the first update, each one contained 2-3 links with pictures to other campaigns that we thought had good audience overlap -- games that our backers might be interested in. No idea if it helped us at all, but we're glad we could kick it forward a bit. Can a campaign page be too long/detailed? When seeking feedback before the campaign’s launch, some other devs commented that we had a LOT of information -- lots of pictures, but also lots of text. But this is the kind of complaint that’s hard to measure during a campaign, since it could just result in fatigue and not funding -- but it’s impossible to know why someone doesn’t fund. I don’t think we had too much, but that’s a personal taste question. I’m not even sure too much is actually possible, but if it is…? Note: Direct Traffic means we don’t know where they came from -- usually it means following a link from an external program such as an email client, or copying and pasting a link directly into your browser. Our newsletter and Square Enix Collective’s email are both lumped in there and presumed to be major factors. 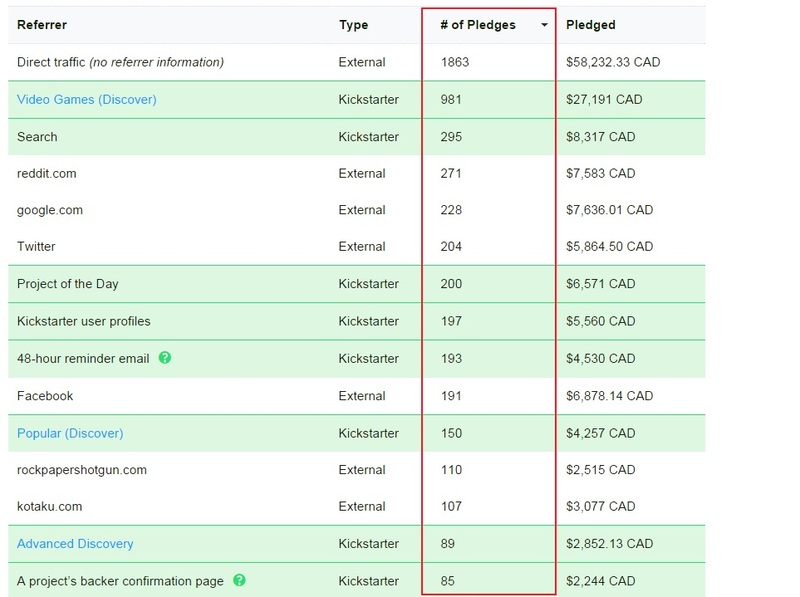 In fact, if we divide the pledge-totals by their number-of-pledges, we can see who our most lucrative backers were. In those top 15 sources, Facebook backers contributed an average of $36, while RockPaperShotgun backers averaged $22.80 -- so a full 33% less! People want to support success stories. The quicker you can talk about some way your campaign is successful, then the more successful your campaign will be. Being funded early changes everything, but even getting to 50% quickly or having a high number of backers quickly can also be brag-worthy, increasing people’s excitement to support a success. It’s a bit saddening to me as a designer, but it seems like a positive feedback loop -- without fail, we were funded more the day after reaching a big stretch goal, not before! Most people want to cash in on high-value products, not help something barely exist. Kickstarter is a great platform -- not just for money! 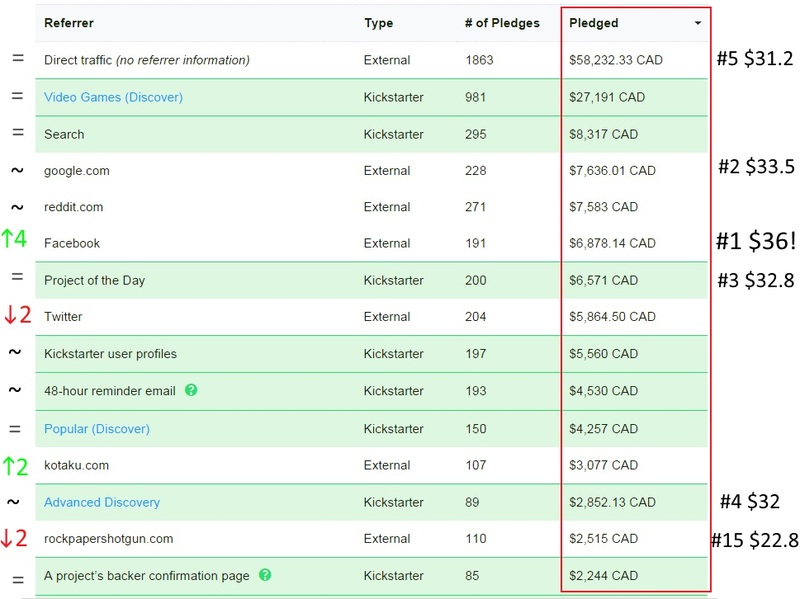 In exchange for the %% they take, Kickstarter not only automatically cross-promotes your campaign through their various site categories and mechanisms, but you can also use them to contact your backers for no additional fees! Most mailing list services, such as MailChimp or Sendy, charge money for mailing lists with thousands of recipients -- but through Kickstarter, we can not only contact our 6000 backers for free, it also gets automatically publicly archived and displayed! Great value. People like words but don’t read. 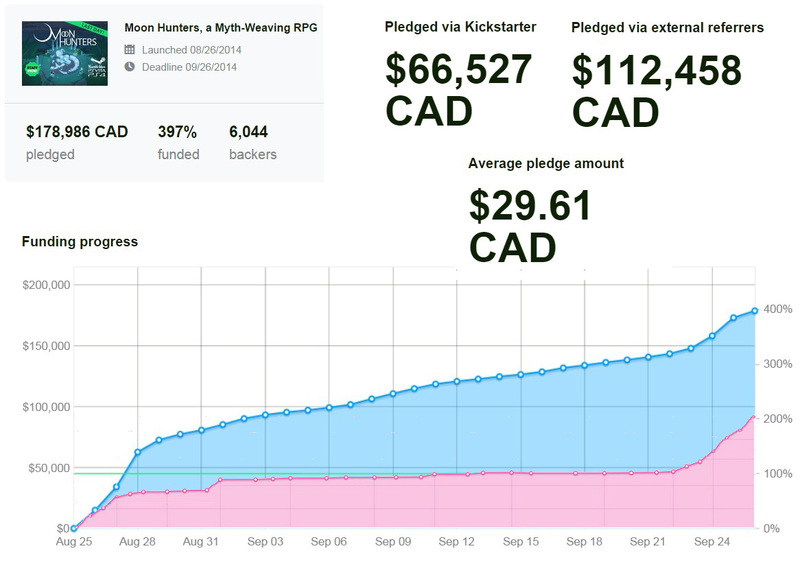 Congrats if you’re still reading this -- you’re not the average Kickstarter backer! We got lots of great comments from backers who were excited about different features, characters, or elements of the game, but they simultaneously betrayed that they hadn’t really read most of it. They’d skimmed some parts or outright ignored pieces they did read. The copy on our Kickstarter page was around 2,000 words! The level of detail probably added confidence for backers, but more detail than most customers will engage with willingly... even their money is involved.